Buy Phentermine Kvk Tech George: Not that we do that, but we know what you mean. Gilbert: We don’t do that. George: That’s what we call a collaboration. Buy Diazepam From India DS: And you don’t do that. What do you do? http://charlotteskitchendiary.com/tag/family-friendly-pasta-recipes/ George: That’s the weird thing. People say it must be so exciting, two people working together. It must be so stimulating, this exchange. http://charlotteskitchendiary.com/comments/feed/ “We don’t seem to have had this exchange—it doesn’t exist. other there’d be battles! Appalling! Buy Zolpidem Hong Kong Gilbert & George’s sense of connectedness is openly declared, very human and yet still somehow ineffable. There is something similar in the role-play of the real life (yet robotic looking) performances of Gilbert and George and Fluxus-influenced avatar performance art. 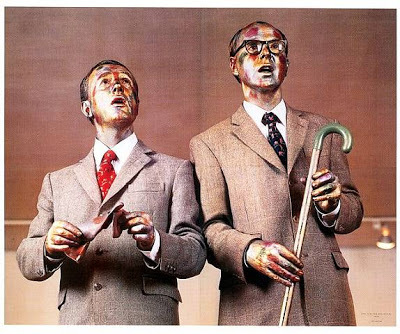 Gilbert & George’s The Singing Sculpture (1970) performances are semi-autonomous, like puppets, automata and mime artists. Green explains that elimination of personality is an important part of this process of roboticised tele-acting. Gilbert and George often reflect on the importance of the brain in their performance-interviews. The artists also cultivate the robotic duality of their celebrated performance work The Singing Sculpture, with all public appearances always undertaken in their ‘sunday best’ suits, ties and polished shoes. Charles Green, The Third Hand; Collaboration in Art from Conceptualism to Postmodernism (Minneapolis, and London: University of Minnesota Press, 2001), 139, 47, 152.